My mother's present this Christmas was a Kindle Fire HD which she really wanted to get her hands on as she is quite often on tour with my father and wants to use it to read ebooks, listen to music and play movies from it. I never got my hands on a Kindle before and had to find my way around it as well. One of the issues that I had to overcome was how to copy DVD movies from disc to the Kindle Fire HD. Since it does not have a disc drive, I knew that I had to rip and convert the movie into a format supported by the Kindle. After some trying and testing I came up with a solution which I'd like to describe here so that all Kindle owners can benefit from the procedure. The majority of solutions that you find on the first few pages on Google and Bing are for solutions that you have to pay for to use, which is something that I did not want. The following solution uses free tools that anyone can download from the Internet. Insert the DVD movie you want to rip to your Kindle Fire in to the disc drive of your computer. Start DVD Shrink and click on Open Disc. 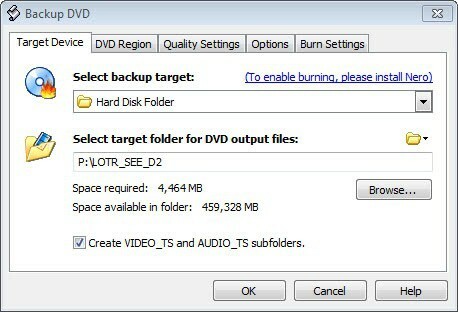 Select the drive with the DVD and wait for the program to analyze the contents of the DVD. Select main movie under DVD Structure and the audio source you want to use. Select a folder on your hard drive you want to rip the movie to. Keep all other settings as suggested by the program. Click on ok to start the extraction. The ripping takes time, usually about 30 minutes before it finishes. You end up with a DVD folder structure on your hard drive. You now need to use the second program to convert those files into a format that the Kindle Fire supports. 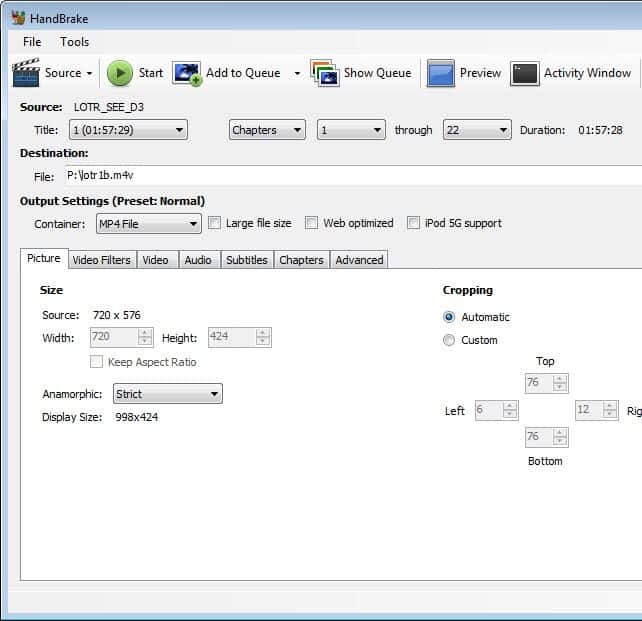 Handbrake is a free video conversion software that you can use to convert video files from one format to another. What you do basically is select the output from DVD Flick to convert it to the mp4 format which is the video format supported by the Kindle. Click on Source first and select the folder on your hard drive that contains the ripped DVD movie. Click on browse then to select the destination file name and location, and finally make sure that mp4 file is selected under output settings. A click on start at the top runs the conversion on the system. Note that you can also process other video files this way that may already be on your system. All that is left to do now is to copy the mp4 video file to the Kindle. Connect your Kindle via USB to your computer and copy the video to the Movie directory on the Kindle. To play videos on your Kindle Fire HD go to Apps and select the personal videos apps there. All videos that are in the appropriate format should be listed here. Just tap on a video to start to play it on your device. Martin, while your method certainly works (I used to do that, too), I would instead recommend using Freemake Video Converter to do everything in a single step. It’s free, allows multiple output formats and containers, does single- and double-pass conversion, and will also save YouTube and similar videos to a local file, as well as converting to MP3. i just used freemake to convert an avi file to mp4 format and am using the es video player on my fire hd. it still wont play. ive been using es media player with all my other movies. can you recommend another player program? I forgot to mention that the same file format (MP4) is pretty much standard across Android mobile devices and iOS devices. You might need to check your device to see what the recommended screen size and bit rate is; my little Motorola Bravo is 854×480 and works better at a lower bitrate; my Lenovo A1 is 1024×600 pixels and can handle a higher bitrate; and my Roku 2XS handles even higher bitrates, 720p files streaming over my home network. Freemake lets you set up appropriate profiles for each device. I have used DVDCatalyst4 with success transferring DVDs to my Nook Color. The program allows you to select your device for formatted output. Format Factory does everything and more. Freemake is good too. I’ve just tried to use Freemake Video Converter to put a film on my kindle fire HD, it won’t play how do I find what settings I need to make it work? I’m a bit of a novice at this sort of thing. Last time I checked, Handbrake was able to do all this in one step. You have to use DVD43 in conjunction with Handbrake for encrypted discs. Been a while, but I think I only had to copy a .dll from DVD 43 and put it in the Handbrake folder. Another variation of this was to start DVD43 as a service (running in background) and then use Handbrake. Works great and I can choose Handbrake’s preset for iPad and that is the same settings Kindle Fire HD needs. Thanks a lot, this advice sorted out problems I was having, trying to use Handbrake alone (possibly because I had not installed dvd43). I like the control you get using “DVD Shrink” first. I found DVD Shrink easy to use as well as Handbrake. However, when I went to download the movie onto our new Kindle Fire HC, it only plays at about a 1/3 or less of the screen. The picture is fine but I’m concerned about why it does not play across the entire Kindle screen? This is actually for our child to be able to watch her favorite movies/etc and having the picture be that small is a great concern. It’s cropped fine but it’s just very/very small on the Kindle Screen. Do we need to use another program (s) beside DVD Shrink and Handbrake or are our settings wrong for one or both programs? I also simply click and drag the file from our desktop to our Kindle File which is connected via USB to the computer with the converted file(s). I have ripped a DVD using Handbrake and transferred it to my iPad with no issues. However, I can’t seem to transfer the file to a Kindle Fire HD. How is it transferred once connected via USB? It was mentioned to use the Movies directory. Where can I find the directory? It seems like it is a simple process but need a little help. The way I do it is the following: I connect the Kindle to the PC using the USB cable. Most operating systems should pick up on the new device immediately. You can then use Windows Explorer or another file browser to explore the Kindle storage. There you should find a movies directory that you copy the files to. Great instructions and I have had success getting the new mp4 to play on my Fire Kids edition. But the video is very jumpy and pixelated. I believe it has something to do with what I am doing in Handbreak because the file that DVD Shrink made plays and looks just fine on my pc. Any suggestions would be greatly appreciated.